After announcing the Tracker and Deluxe Audio Strap for its Vive VR headset last month, HTC has now revealed more details about the additions. The more intriguing of the pair, the Vive Tracker, will be available for developers to order on 27 March for $100, with the peripheral tracker allowing you to bring real world objects into the virtual realm. While this is good news for developers, it's not known when exactly consumers will be able to pick up the Tracker, besides HTC's hint that it would be available later in the year. Whether the price remains the same is also up in the air. Meanwhile, the Deluxe Audio Strap is set for pre-orders on 2 May for the same price, with deliveries set to drop to consumers in June. It's essentially a pair of integrated headphones akin to the Oculus Rift's, which is a healthy upgrade on having to plug in your own when strapping on the headset. HTC also noted that the strap will be integrated into the Business Edition of the Vive for no extra cost. We were impressed with the 10cm-wide Tracker when we tried it out at CES 2017, though the potential success of this attachment will largely sit on the shoulders of developers getting a first look. Thankfully, there are already encouraging applications in the works. 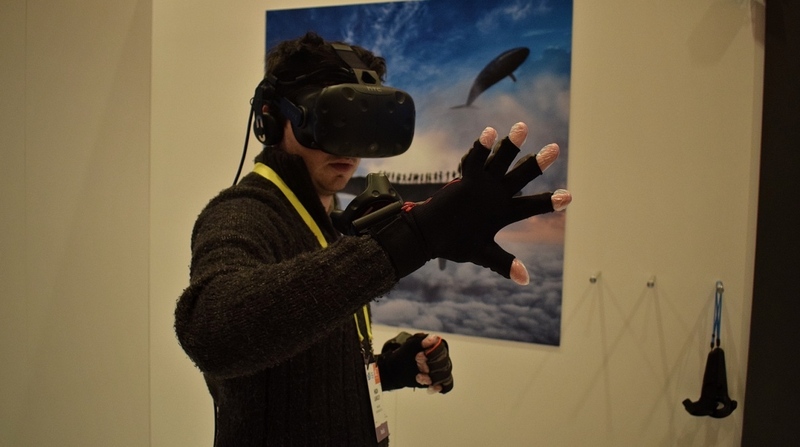 For example, company Noitom was showing off a pair of gloves which use a tracker each to give you full use of your hands and fingers in VR, allowing you to pick things up, throw them about, and even draw with your fingers.